This workshop is an activation to align your energy and bring your frequency to a higher vibration. Thus, opening your heart, and expanding your soul to its true divine nature to allow you to remember the origin of your essence and the knowing that you are always connected to everything. As you hold this within your heart and come from this space of truth, your awareness will continue to stay with you for now and forever. The workshop starts with a group session that connects one’s soul to their truth, and in return, the heart opens. This is the beginning of an awakening and a process that brings you to be more receptive to the entire days of energy work. This part of the workshop we journey into reconnecting the separation that we have created from oneness. [Feminine or masculine, father or mother, me and you, and the I] all is pointing to the self. working with aligning your energy field for a kundalini awakening when you are ready. This workshop can be attended as many time that people want, this is an energetic activation that is related to the energies of the now meaning this moment. This workshop will fill up fast, so please don't wait until the last minute to sign up in order to guarantee a spot. The remaining balance of $130 cash is due at the event. The people that don't have PayPal please contact Mohammad so other arrangements can be made. Please bring your own mats and pillow for your comfort. Please bring your own food or snacks for the duration of the workshop, water will be provided for you. Mohammad looks forward to sharing and connecting with you as we shift to a higher consciousness. Please bring a mat, pillow and a blanket for your comfort. Please bring your own food or snacks for the duration of the workshop we will have a lunch break. This workshop will fill up fast, so please don't wait until last minute to sign up in order to guarantee a spot. 275 First Street- Upstairs Unit 13, Collingwood. A deposit of $50 non-refundable is required to reserve your spot. Theremaining balance of $130 cash is due at the event. 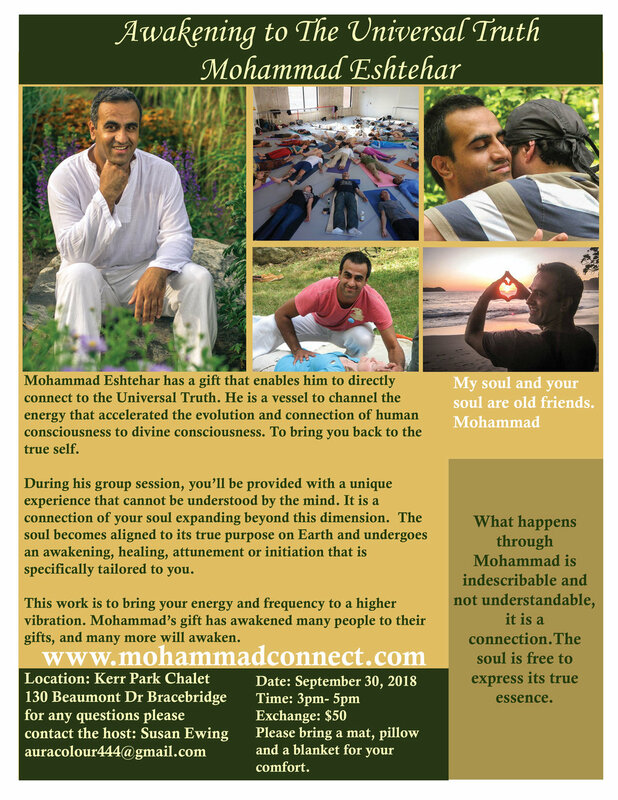 Mohammad Eshtehar has a gift that enables him to directly connect to the Universal Truth. He is a vessel to channel the energy that accelerated the evolution and connection of human consciousness to divine consciousness. To bring you back to the true self. During his group session, you’ll be provided with a unique experience that cannot be understood by the mind. It is a connection of your soul expanding beyond this dimension. The soul becomes aligned to its true purpose on Earth and undergoes an awakening, healing, attunement or initiation that is specifically tailored to you. This work is to bring your energy and frequency to a higher vibration. To inspire you to directly discover your true nature. Mohammad’s gift has awakened many people to their gifts, and much more will awaken. What happens through Mohammad is indescribable and not understandable, it is a connection. Don’t miss this incredible experience where you will be called upon by your soul to connect and experience an awakening. To reserve and guarantee a spot for the event you can pay via Pay Pal please use the friends and family option, also let us know that it is for this event. Please bring a mat, a pillow and a blanket for your comfort. We look forward to our soul connection. As you hold this within your heart and come from this space of truth, your awareness will continue to stay with you for now and for ever.